Capture and share your life's most meaningful experiences with the HERO3+ Black Edition. 20% smaller and lighter than its best-selling predecessor, it delivers improved image quality and powerful new features geared for versatility and convenience. SuperView™ is a new video mode that captures the world's most immersive wide angle perspective, while Auto Low Light mode intelligently adjusts frame rate for stunning low-light performance. Combined with 30% longer battery life, faster built-in Wi-Fi and a sharper lens, the HERO3+ Black Edition is the most advanced GoPro yet. 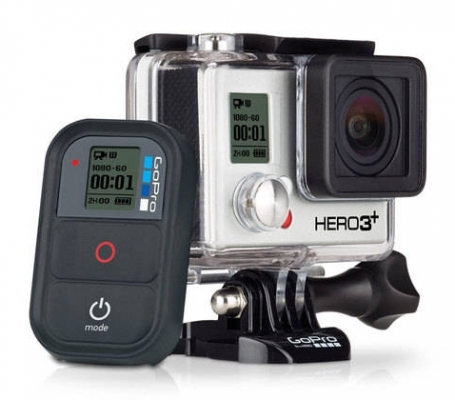 – GoPro Hero 3+ Black Edition, protective case GoPro, Wi-Fi remote controller, 32 GB memory card (+ adapter SDHC); 1 battery (for 4 hours).